Using the latest controls technology to provide long drying and mixing times for consistent, high quality asphalt, Asphalt Drum Mixers Inc., Huntertown, Indiana, offers the EX Series single-drum counterflow asphalt plants in stationary and portable models. Counterflow design is based on the process and movement of the material through the drum in the opposite direction of the heated airflow and combustion gases. Here’s how it works. The aggregate flows through the slinger conveyor—or optional inlet chute—into the drum, which has six different zones. The material first enters the pusher zone. Here, the steep spiral design helps push the material into the drying zone, where the combination of J-type, saw tooth, and basket style flights, set in a herringbone pattern, lift and move the material forward through the drum. The lifting creates a veil of material through which the hot air travels. This allows for heat transfer to the material. After the drying zone, material moves into the combustion zone. The combustion zone has specially designed T-type flights, which keep the material against the shell of the drum. This serves two purposes. First, it keeps material from falling through the flame, and second, it helps insulate the drum shell from the heat. The nozzle of the long-nose burner is located about a third of the way into the drum, which allows for a separation of the drying and mixing zones. Past the combustion zone and behind the flame, the material passes through the reclaimed asphalt pavement (RAP) and additive introduction zone. Here, the now dry virgin aggregate mixes with the baghouse fines being reintroduced into the process and any RAP or dry fillers being added into the mix. 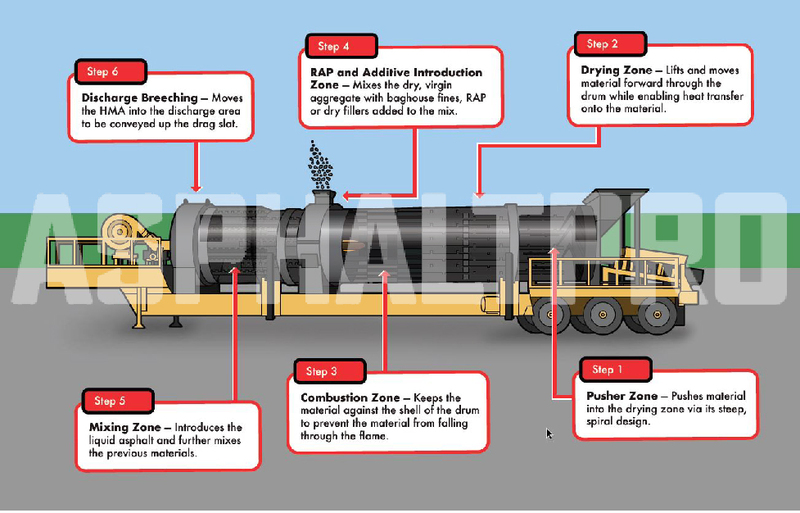 The next zone is the mixing zone where the liquid asphalt is introduced and the previous materials are further mixed. Once mixed, the now hot-mix asphalt (HMA) is moved into the discharge area, where it is lifted and pushed out through the material discharge chute, into the drag conveyor. From here the material moves up the drag into the storage silos. For more information, contact sales at (260) 637-5729.